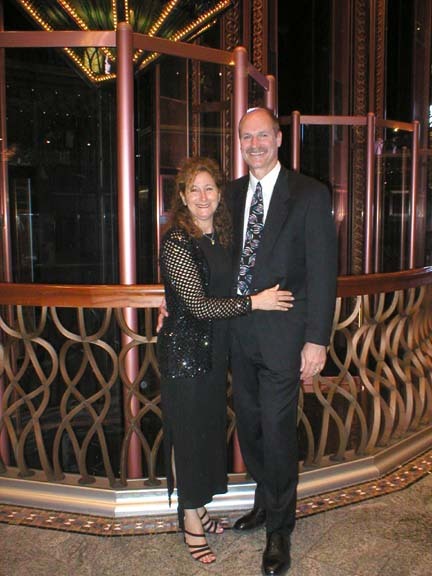 We are back from our eight day cruise; we were gone from February 27th through March 7th, 2004. 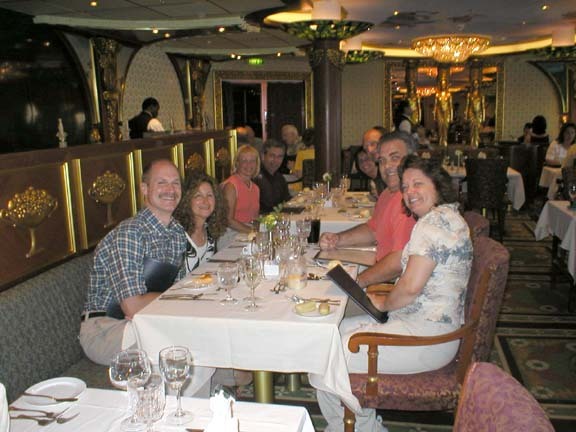 The package we booked was through Ship-n-Shore Cruises, out of Englewood, Florida (800) 925-7447. 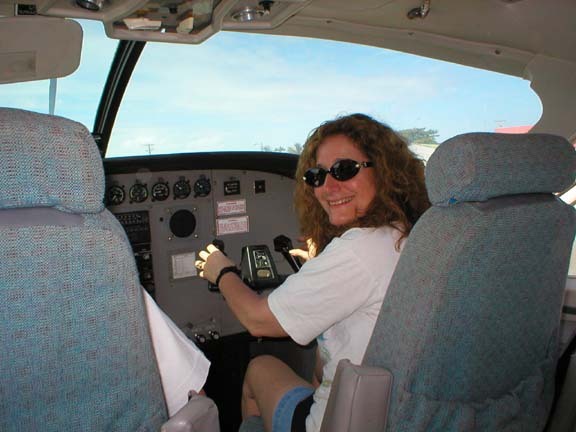 This trip was plan B, because we had already paid for airfare to go to our condo in the Keys, but we rented our condo to snowbirds from January through March. See our condo link at the end, if you are a snowbird looking for a nest for the winter. I will give a breakdown of what we did, saw and at the end tips for anyone else doing this itinerary. Since we only had one day per island, we didn't have enough time to get to know them well. Our flight on NWA left Detroit Metro at 9 pm and got in Miami about midnight. It took NWA about 45 minutes to get our luggage to the baggage claim and they lost one of our straps we bought to secure our suitcases since you can't lock them anymore. So we started some shut-eye at 1:45 am, in a Radisson hotel in Miami not far from the pier. Lynn found it through information on www.cruisecritic.com and was able to bid on www.Priceline.com and get it for $45 for one night. We took taxis to the hotel and pier, which was about the same cost as renting a car for the day, and easier. We got on board by noon even though it said boarding at 1:30 pm. We had book a guaranteed class 4 inside cabin or better ($660 each), and they sold all those rooms, so we were bumped up to a class 6 outside cabin with a window about 3' x 3'. Our room was 1241, on the first floor (Riviera), in the starboard aft (right rear) of the ship. 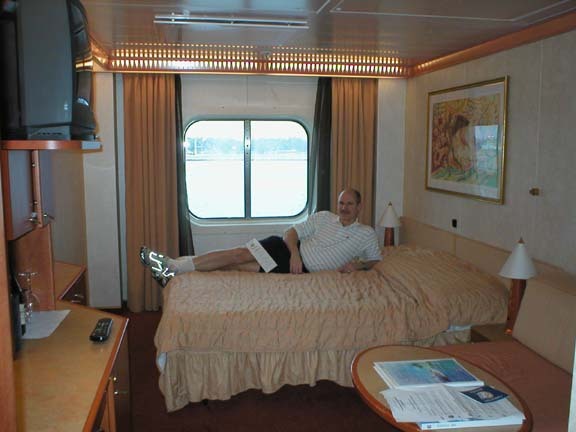 It was a large room compared to my memory of past cruises. I think our window was about 12' above water level. Being low in the ship was nice with little rocking and nice water views. Our room steward was Francois from Haiti, who was great, and made us towel animals five nights. Our cruise left at 4PM. Our assigned seating for dinner was at 5:45 which was fine, but I would prefer to have the freestyle dining, like Princess does. Freestyle is where you can go to a dining room whenever you want (when they are open) and just sit with whoever else shows up at that time. You still have the ability to make reservations or sit by yourself at a small table, but it doesn't seem as regimented to me. We were up late, (10 am) and off to jog on the treadmill, then back to shower, and to lunch. We went to the Art Action from 1:00 - 3:00, and impulse got the best of Lynn, as she bought one piece. It was Formal night and they served Lobster, and Prime Rib as a couple choices. You usually only get Lobster once per cruise, so I had to take advantage of it. They did have a Cherries Jubilee as a dessert, but it was a let down, just a scoop of ice cream and a few cherries, no fire or anything. 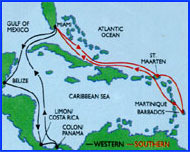 We anchored in Belize at 7:00 and could get tender tickets at 9:00, that let us off by 10:00. The ships tours got first priority, and got off first. We made shore by 10:15 (9:15 Belize time). 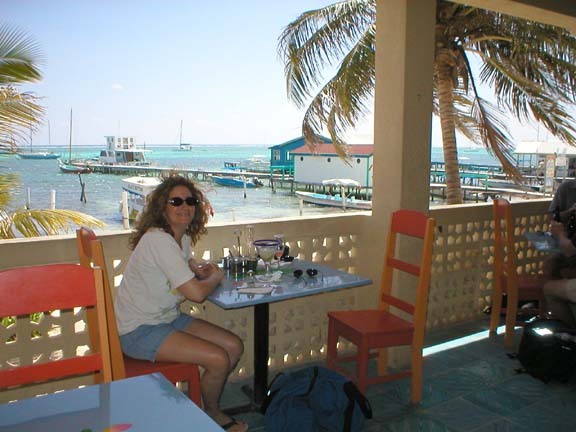 We had planned on taking a water taxi from the downtown marine terminal to Caye Caulker (40 min.) 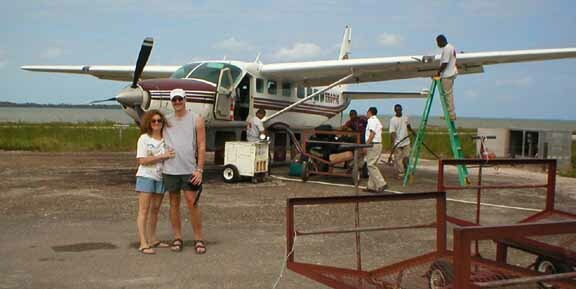 and go snorkel, but got talked into taking a plane to San Pedro for $49 each (Tropic Air 1-800-422-3435, www.tropicair.com). It was an hour and fifteen minutes to get there by boat, but only 15 minutes by plane. Our taxi driver (Michael) that talked us into it drove us to the airport for $10. The views and experience was worth it, as we flew in a 12 seater. We thought we would snorkel wherever we went, it was sunny, but it was windy, so we decided to just hang at a beach. All the beaches at the resorts were public, so we sunned ourselves a little at Ramon's Village (501-226-2071), which is a good place to go for scuba diving and accommodations. 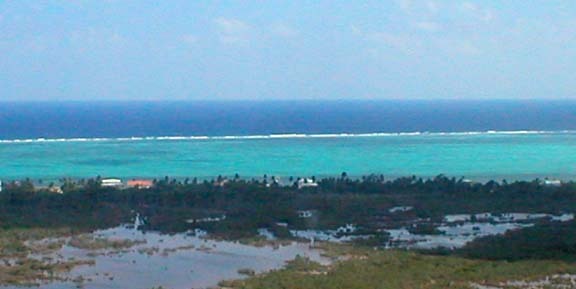 The reef is only 2/3 a mile off shore, so you could rent a wave runner and take yourself snorkeling. I am not sure where they rent them, but I heard they do. We walked down the beach and ate at a restaurant called Caliente (501-226-2170), which had excellent Mexican food at good prices ($26 for 1 drink, two large lunches, and tip). Another restaurant we heard was good, was Fido's Courtyard. The belizean money is $2 for one American dollar. After lunch we walked to the airport, there was not a lot open on Sunday. They fly as many planes as they need for the amount of passengers they have, when we went there was four small planes going back. We were confused at first, they landed at an International airport we did not recognize. When we asked they said next stop was the domestic airport that we had left from. So without getting off the plane, we were off to the domestic airport in about 5 minutes. When we got back, Michael our taxi driver was there to take us back for another $10, he wanted to give us a tour, but we were tired. When we got back to the Pier we had to try a local "Belikin beer" which was very good. 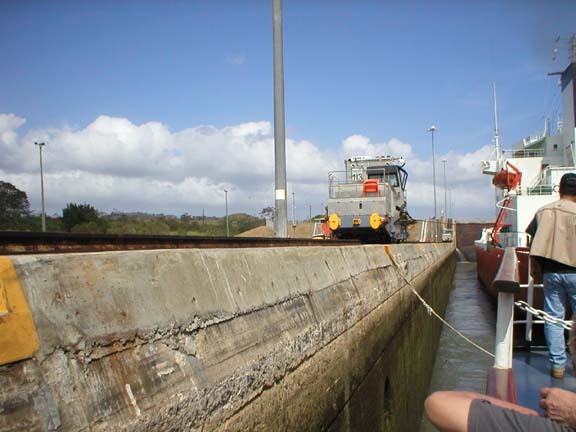 We then made our way to the tender and it was the last tender going back to the ship. We had gotten back at 3:00 local time, the last tender was to leave at 3:30 and thought the boat was on local time, but it stayed on ship time, which was 4:00, when the ship was to leave. As we were boarding the propeller was starting to turn. Whew! Lucky we didn't let him give us a quick tour. 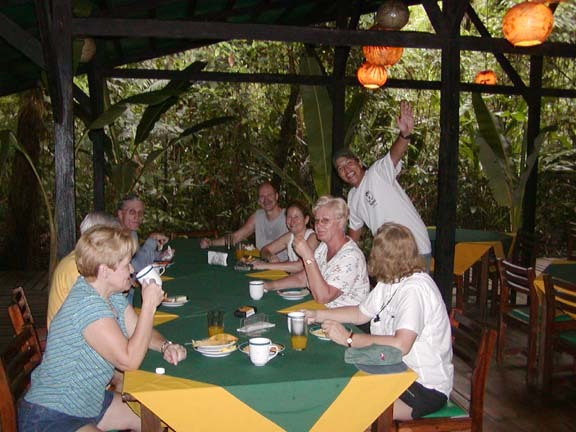 At dinner that night, we heard the cave tubing was also a fun tour. That night we were tired, and a little sun burned, from the spots we missed spreading the suntan lotion, so after dinner we went back to the room and watched the Oscars. Carnival's description of Belize: If you love adventurous locations where you can explore ancient ruins, trek through a jungle, climb mountains or scuba dive among incredible coral reefs, the tiny country of Belize is nirvana. 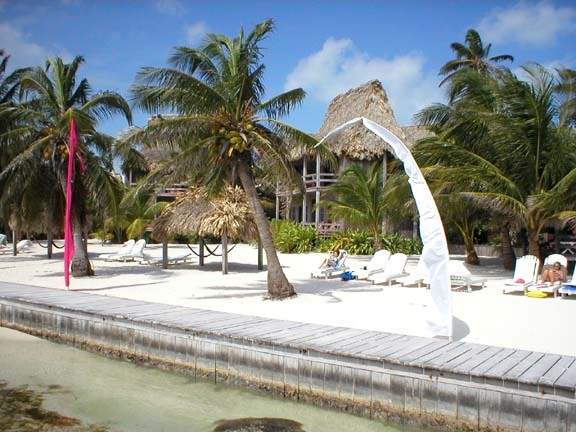 Apart from its archaeological sites of Mayan civilization, Belize boasts more than 175 sandy islands, 240 varieties of wild orchids, 500 species of birds and some of the world's best dive sites. Visiting the Mayan ruins is a once in a lifetime experience. English is the official language and the climate is subtropical. 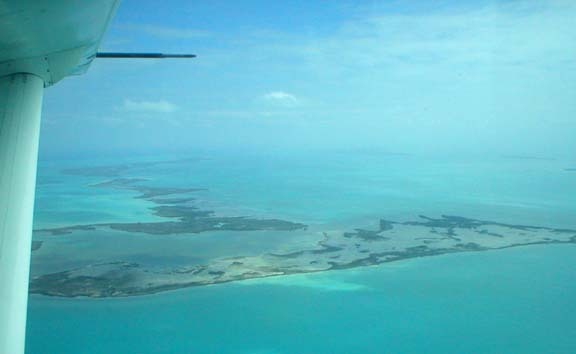 As a point of interest, Belize has the second longest barrier reef in the world. Up late again, 10:00, and off to the gym. I treadmilled and Lynn did the elliptical machine. Then off to lunch upstairs on the Lido deck (9th floor) LaPlaya Grill. 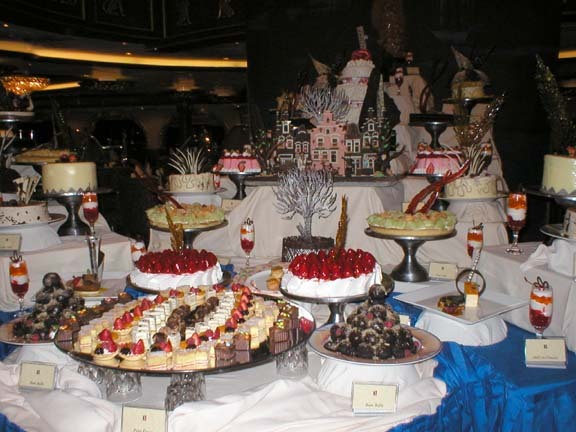 It is an all you can eat buffet, so you have to watch it. The food was good, not great in my opinion and the layout seemed strange. 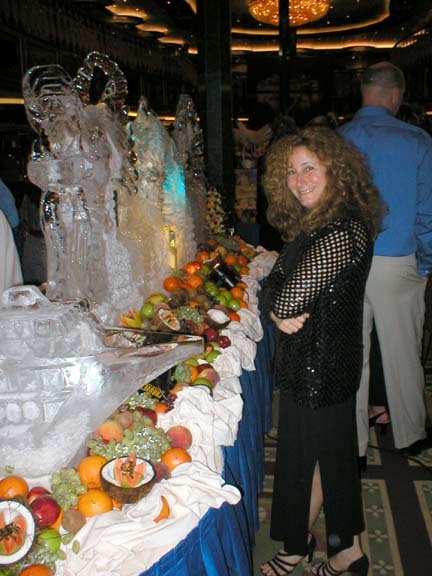 They had about seven different stations to get salad, fruit, a ethnic food of the day, a couple with similar main dishes, burgers and dogs by the pool, and deserts. So you had to walk around to see everything and decide what you wanted, then get in line. They also have pizza and caesar salad round the clock up there. Lynn went to the Art Auction again (to observe only) and see if she could win a prize. I decided to explore a little, and just relax. 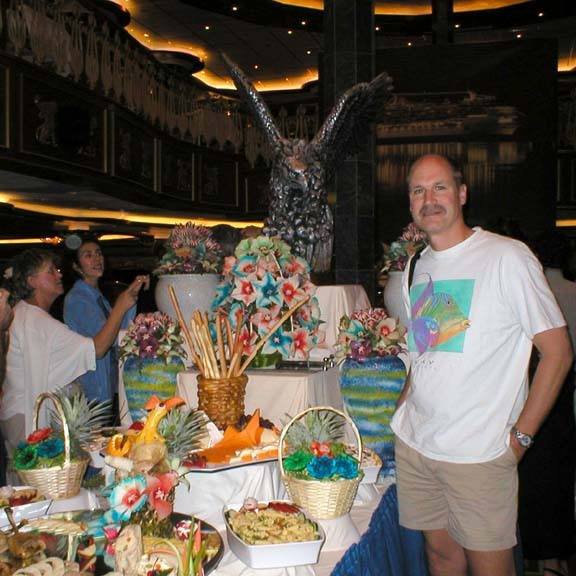 We went to the return cruisers party from 3:00-3:45 and had appetizers and drinks. Off to dinner at our usual 5:45, and then we went to a Sinatra, Sammy Davis review at Pharoh's Palace (level 2, forward) at 8:45. Up by 9:30, we both did the elliptical machines and some weights (my knee was bothering me, from twisting it playing tennis a week before). We went to breakfast upstairs (Lido deck). We were docked by noon and beat the tours off the boat. 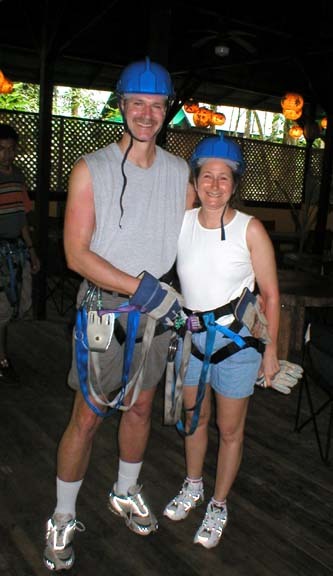 Lynn had reserved Ziplining (the Crazy Monkey Canopy Ride) with Almonds and Corals Lodge (506-272-4175, www.almondsandcorals.com). 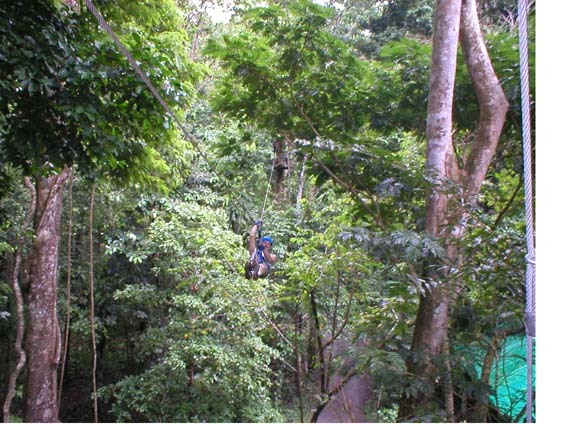 Ziplining is hooking your harness to a cable and rolling from one platform in a tree to another. They had our name on a sign and we got on a van with about 14 other people who had reserved it. Carnival does not offer it currently, as they want an extra cable added, as an extra safeguard. 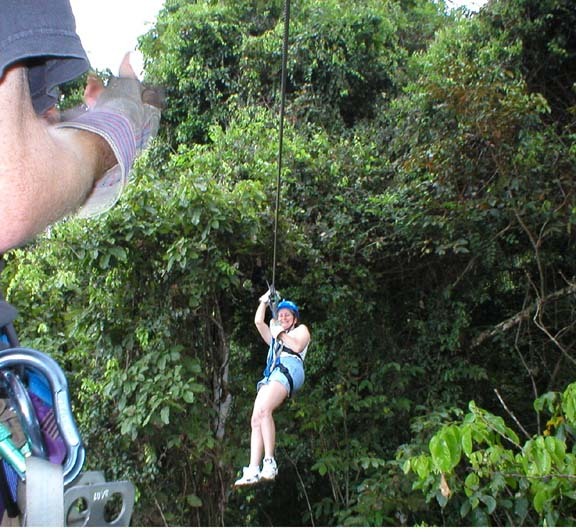 It cost $75 each, which included the hour and a half van ride each way, ziplining (there were eleven cables slides), we went in groups of 4-5 with two guides per group to hook and unhook you, and some fruit at the end. It seemed safe, as you were always hooked to something. 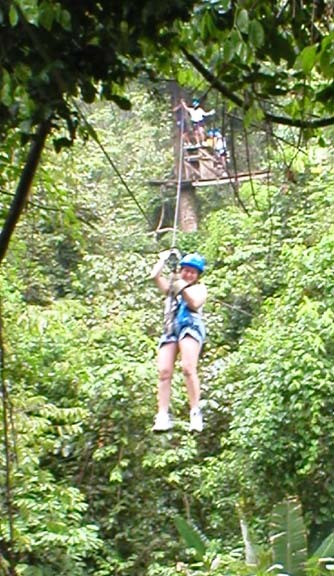 My wife is afraid of heights, but booked it, overcame it and had a exhilarating time. It is a rainforest, so dress accordingly (expect to get a little wet). We only got about 10 minutes of rain the whole trip. Our driver Manuel did not speak good English, but was very good at spotting wildlife and stopped the van so we could get out and take pictures along the way. Danny (owner's son) spoke excellent English, gave us background, answered questions, and gave interesting information along the way. He did say the area we were driving through was poorer and less developed. 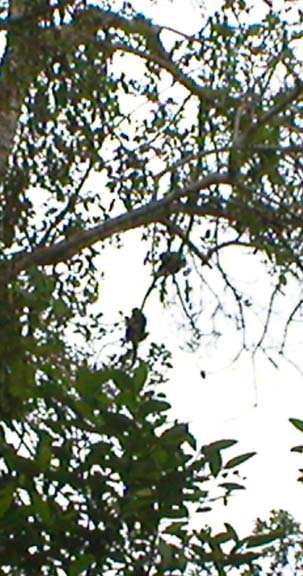 We saw sloths, monkeys, birds, butterflies, and iguanas along the way. The van was nice and comfortable. We stopped at some small roadside stands (beside a nice beach) on the way back, for souvenir shopping and an Imperial beer. We got back the ship at 6:30, so since we missed our dinner seating, we ate upstairs. That night we went to bed early, because we were getting up early for the next tour in Panama. 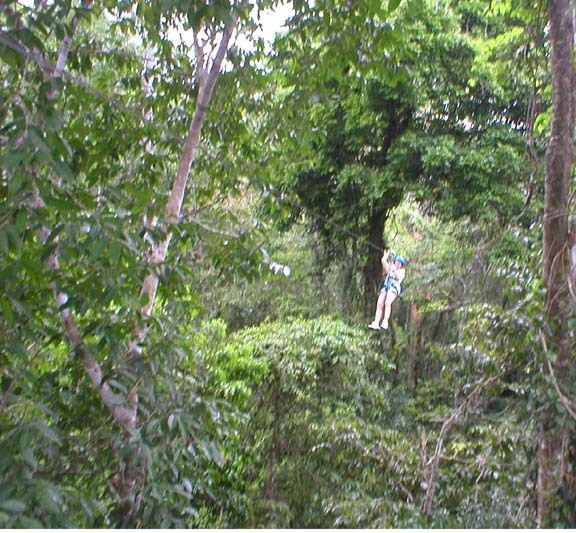 Carnival's information describes Limon, Costa Rica as: Between Costa Rica's Caribbean and Pacific coast are rugged highlands, about 3,000-6,000 ft. above sea level. A central plateau, the Meseta Central lies between the principal mountain ranges and contains the bulk of the population. The climate rages from topical along the coast to temperate in the highlands. Annual precipitation averages about 100 inches. 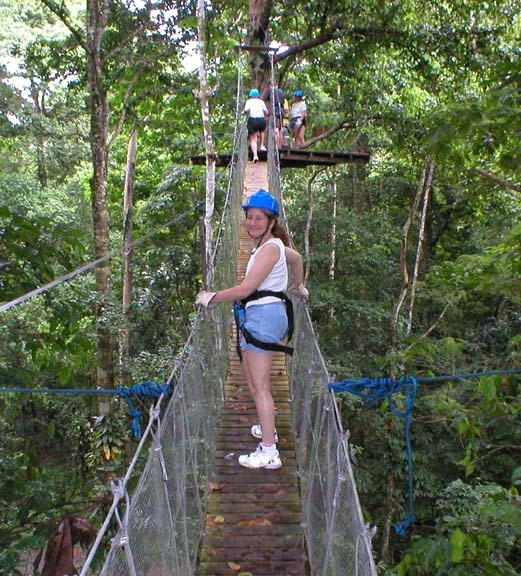 Costa Rica's resources include fertile agricultural soils, abundant forests and extensive fisheries. 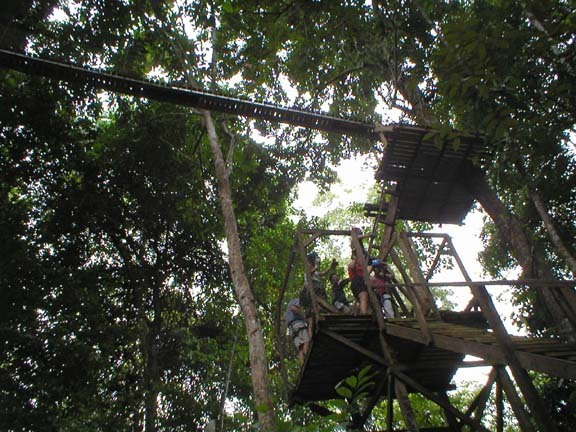 About 25% of Costa Rica's land has been set aside for parks, wildlife refuges and preserves. Some 3,000 species of butterflies have been spotted in the country. Estimated population is 3,534,174. Most of the people are mixed Spanish and Native American descendent. Roman Catholicism is the state religion. The literacy rate is 95%. The average life expectancy at birth is 76 years. The primary exports include coffee, bananas, beef, textiles and sugar. Costa Rica has no armed forces. There was a general advisory from the U.S. Department of State Bureau of Consular Affairs, advising to dress conservatively, go out only in groups, watch out for pickpockets, etc. 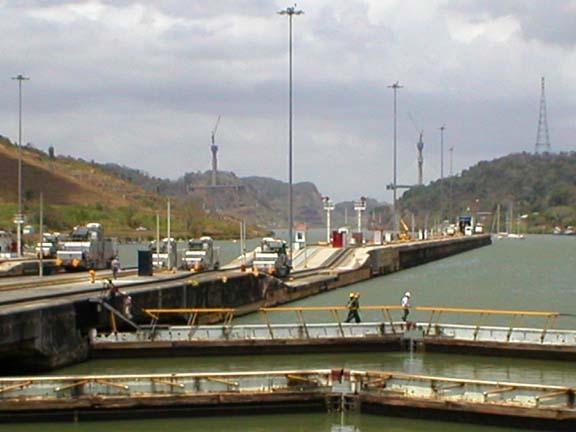 or Colon, Panama. 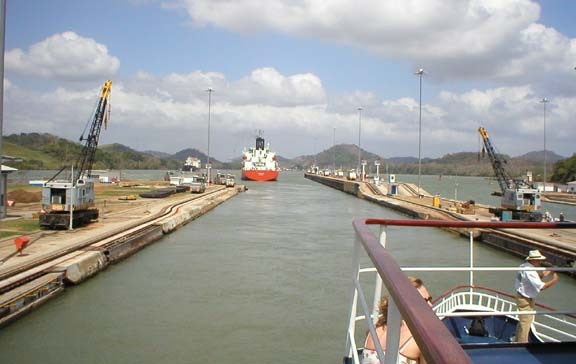 Carnival's info said: The City of Colon, Panama is situated at the Caribbean end of the Panama Canal. 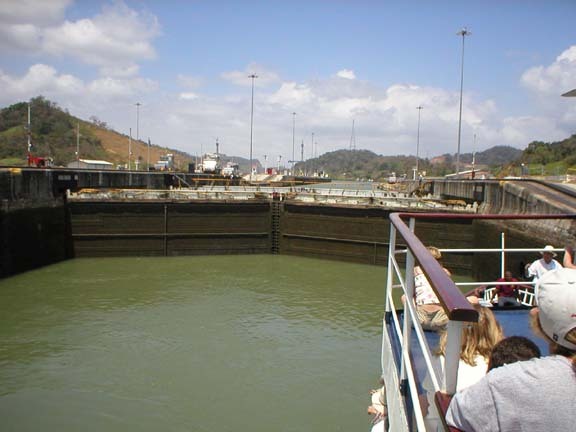 Colon, the second largest city in Panama, was surrounded by, but not part of, the former Panama Canal Zone. 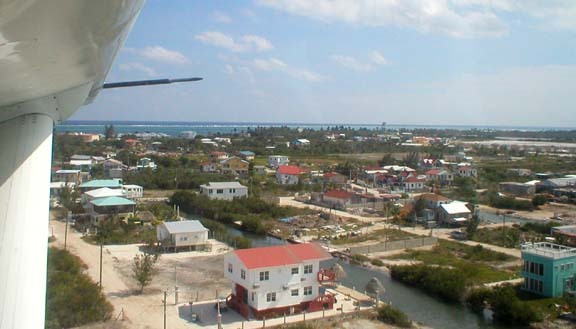 Colon is an important port, commercial center and tourist destination. 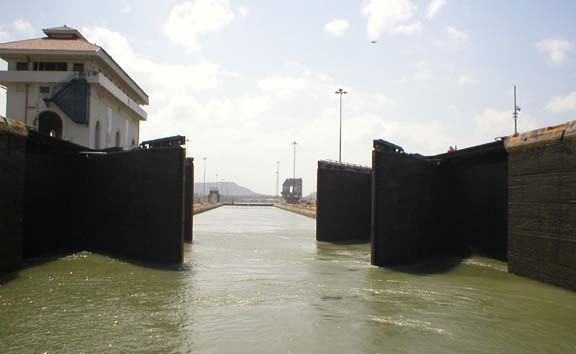 It was made a free trade zone in 1953 and is the world's second largest duty-free port. The city was founded in 1850 by Americans working on the trans-Panama railroad and was named Aspinwall until 1890. Built on a swampy island, the city was often scourged by yellow fever until the sanitary work associated with the construction of the canal was completed under W.C. Gorgas. Up at 5:30AM, to get ready for our tour, the only one we booked through Carnival. We ate breakfast at 6:15 (the hot food started at 6:30), and down to Pharoh's Palace at 6:45 as instructed to meet for the tour. 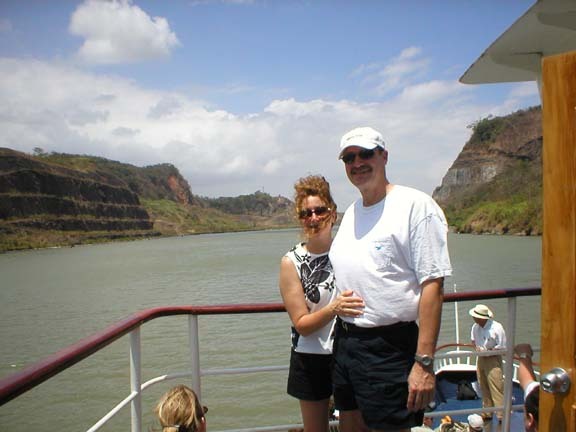 It was the Panama Canal Tour, the cost $175 per person, but we thought, it may be the only time we are here. Wouldn't you know it, we were a little late docking and didn't get clearance to exit until about 8:00. We did get lucky as they exited, we were in the back and got on bus 1 of 6 to go to the ferry. The bus ride is about 1 hour and 15 minutes each way, so you get to see some of the country. Since we were one of the first ones on the ferry boat, we went on the top deck, forward and sat in the sun with a good view. 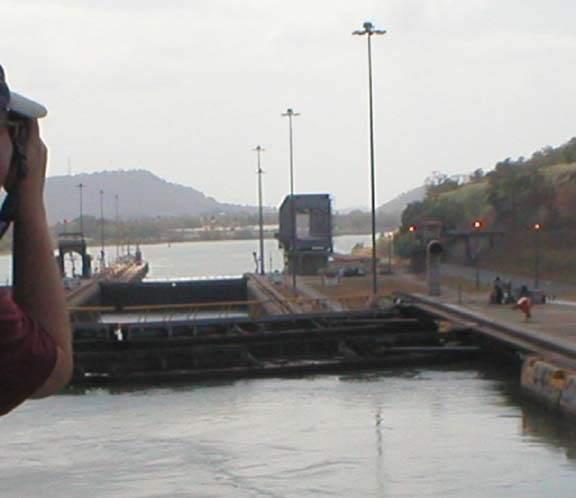 We did have 30 sun block on to protect ourselves, it was a four-hour ferry ride in the canals, to go half way through. We went from sea level Atlantic Ocean, up to the lake level in the middle. If you kept going, you would go back down to the same Ocean level in the Pacific. 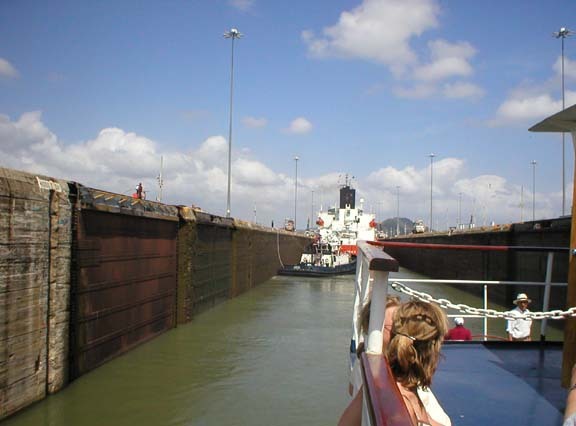 The French started the canal, but after doing about 1/3 of it went bankrupt and had too many deaths. I believe, it was 5 years later when the U.S. made an agreement and started the task. 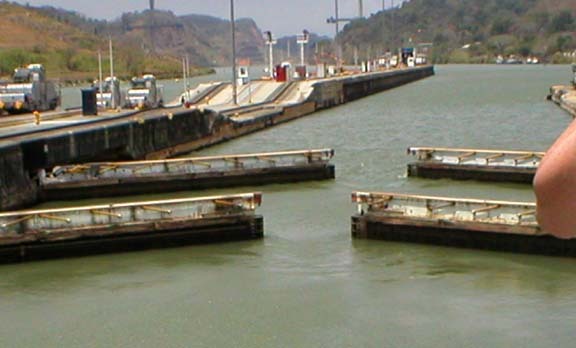 The United States turned the Panama Canal over to Panama in 1999. 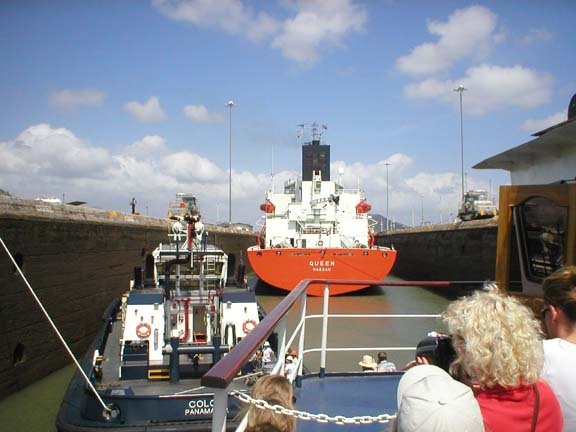 Panama changed the way it charges ships and it sounds as if it is very expensive. For a cruise ship to go through it cost, I believe they said $225,000. 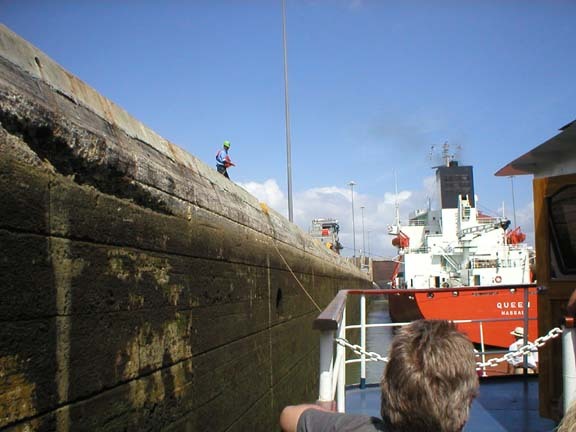 I did talk to a captain who has taken cargo ships through there and he said it was $125,000 for his ship. Maybe the $175 per person wasn't so bad?! After our drive back, and getting a few souvenirs at the dock (coffee, and good prices on liquor, you could buy a two-liter bottle of absolute vodka for $15, two liters of Bailey Irish Creme for $28, etc., if I only had packing room), we got on the boat, which left 10 minutes later. Off to dinner after cleaning up. We were tired, so we went to our room and watched some TV and relaxed. 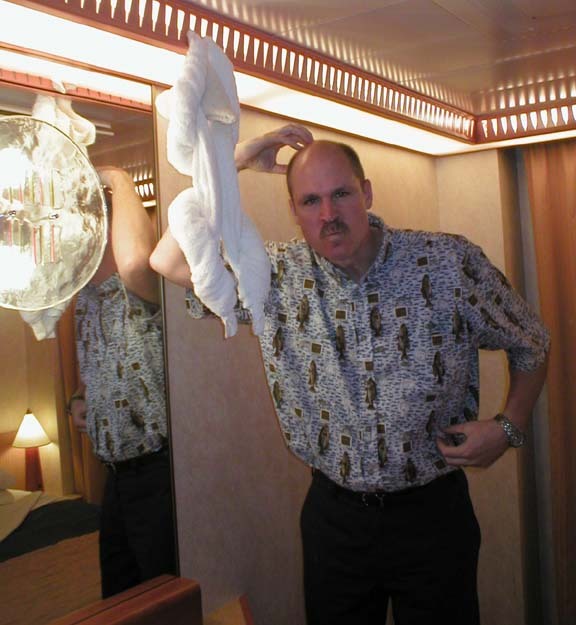 The weather got windy and the captain said the waves were getting 12 to 14 foot, so they had sea sick bags all around the ship. 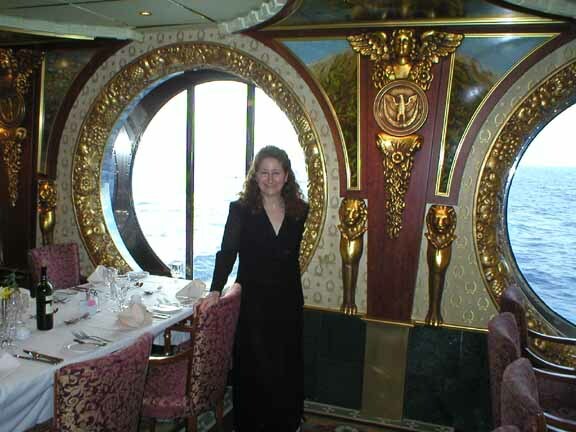 Our room, being lower and in the rear helped protect us, and Lynn, who gets seasick very easily, did not take any bonine and just wore the electronic seasick ban I bought her a couple times, just in case. We heard some did get sick, but no problem for us this trip. Still windy, and rocky, but we got up and exercised in the gym, had breakfast, did some laundry, lunch, art auction, pack some, and off to formal night two. By afternoon the winds laid down. Went to the shop and stayed up for the 12:30 food presentation, and 1:00 food eating. Yes, we were bad. To bed by 1:30ish. 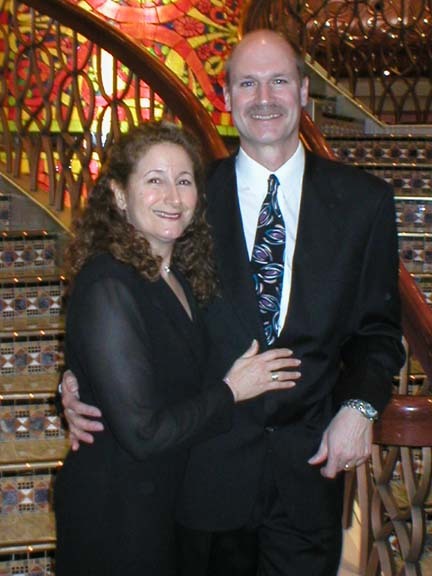 Last sea day, up by 9:30, to gym, elliptical machine for 25 minutes, off to breakfast upstairs, hear disembarkation talk, then Lynn off to massage and facial (discounted the last day), while I went to the art auction to see if we would win anything. Nope. Then off to diner. 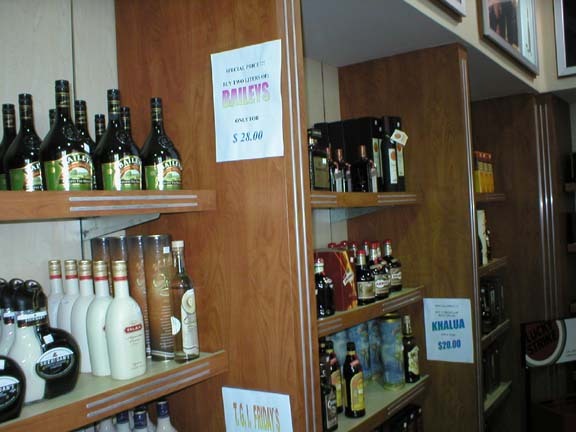 Liquor prices in Panama: Baileys Irish Creme - two one-liter bottles for $28, and Absolute vodka, $15 for a two-liter bottle, $8 each for one-liter bottles. On the boat you can buy (liters for examples) Bailey's Irish Creme, two for $29.95; Absolute, two for $18.95; Kahula, two for $22.95. The boat had a price guarantee, but you had to have written proof. Art Auctions on board had many good deals if you want to buy some artwork. The prices were probably less than half of what it would cost you in galleries, and insured shipping was $35. There were washers and dryers on the Spirit, so you could pack lighter and do a couple loads of laundry in the middle of the week. The cost was $1 to buy the soap, $2 each washer and dryer. I could have gotten by with (dinners-two docker pants, four collared shirts, comfortable shoes, and four pair of socks), (formal night dinners-a dark suit, tie, dress shirt, dress shoes, dark socks), (for sunning, exercising, excursions-sandals, tennis shoes, one swim suit, two jogging shorts, two regular shorts, five t-shirts, four white socks), (to get to the warm-blue jean, long sleeve shirt, light jacket) and (underwear, belt, hat). This is with the assumption I can do some laundry on ship. Recommended tips for the room stewart, dining room staff, and buffet staff were $10 per person, per day. So our tips for two for our eight day cruise was $160. 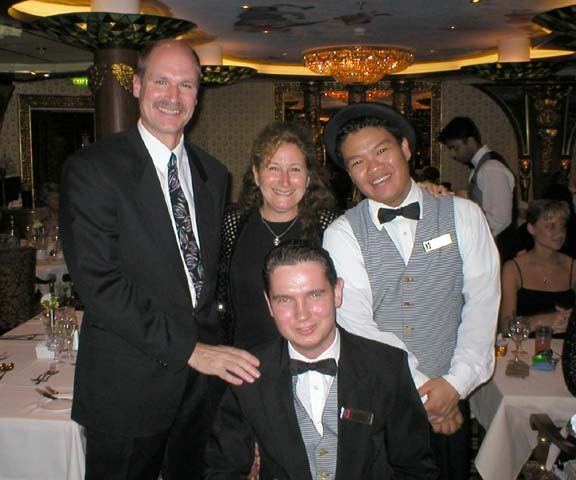 On this cruise you could not buy liquor and bring it on the boat, they would keep it until the end of the cruise. You could bring on wine when you first boarded. There were no picture deals either. The clientele was mainly middle aged, and older.